Halloween dog costumes are made of soft, durable, high-quality fabrics with Velcro® closures for easy fastening and a secure fit. 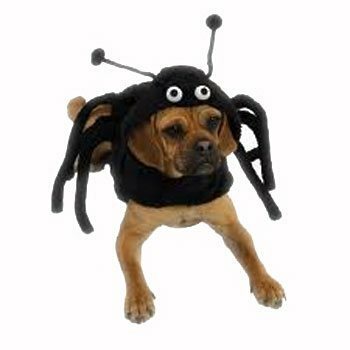 Black spider dog costume is made of lightweight black plush with six realistic legs for added Spider detail. Hood features big eyes and antenna, while the Velcro closures on the neck and belly offer a secure fit. Back: Measure the length of pet's back from the base of the neck to the base of the tail. See below for estimating by breed. X-Small Up to 8" 8" - 12" 14" - 18"
Small 8" - 12" 12" - 16" 18" - 22"
Medium 12" - 16" 16" - 20" 22" - 26"
Large 16" - 20" 18" - 22" 24" - 32"
X-Large 20" - 24" 20" - 24" 28" - 38"